Gabrielle Nankivell is an incredible dancer. When she moves she seems to leave traces in the air like a wisp of smoke. She dissolves into the floor at speed, hurtling into rolling sequences and in the next motion leaping skyward with lightning strength. She is also a choreographer and writer, employing all her talents to create this poetic work in collaboration with sound man Luke Smiles and designer Benjamin Cisterne. Her words are spoken, projected and danced, creating a slightly naive world of imagination and flickering images, where surviving the tribulations of daily life is both a struggle and a joy. The dance is fragmentary, each episode revealing a different character, mood or situation. In one scene she embodies the carefree waft of a summer breeze, while another under strobe lighting has all the violence and speed of a martial arts movie. From a visceral crawl through the trenches of World War I to a comedic sequence with instructions on how to survive an attack by a metaphorical bear, Nankivell seems to be extrapolating from personal experiences, revealing something of herself and how she sees the world. Her colourful text coexists with the choreography, running parallel without overpowering. The audience has time for immersion in the aural realm of voices and soundscapes, and projections are displayed long enough for their impact to be properly absorbed. In the main, the piece is polished and effective, but just occasionally it slips into the obvious and saccharine. There are great surprises and evocative images, but some of the poetry is a little under par and certainly not as refined as Nankivell’s physical performance. 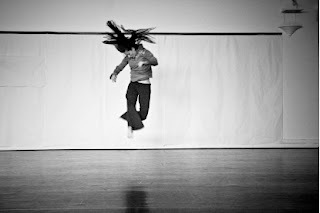 Ultimately, it’s her skill as a dancer and the calibre of her collaborators which makes this piece a success. she looks awesome in the photo. can't imagine that shes a girl.